The second of three promised reviews for this week, Kingdom Hearts 3D: Dream Drop Distance released at the tail-end of July for North American Nintendo 3DS owners. Is it a worthy installment for fans of the Kingdom Hearts series? Let's discover that answer for ourselves with this review. 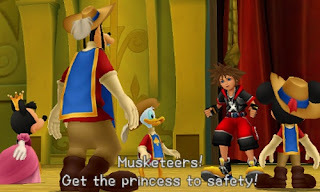 For many years now, fans of Kingdom Hearts have been begging Square Enix to develop the actual third mainline installment of the series in the desire to have the story move forward in a significant manner. Instead, Square Enix has been releasing spinoff games with elements of backstory spanning across multiple platforms with multiple characters, making the Kingdom Hearts fan base nuts. Finally, it seems we are getting somewhere with the Nintendo 3DS exclusive, Kingdom Hearts 3D: Dream Drop Distance. This game does not hide the fact that it directly ties into Kingdom Hearts III. With a story that expands on the Kingdom Hearts lore and brand-new Disney worlds to explore, does Kingdom Hearts 3D go the distance, or should perspective buyers simply drop out? As stated, the story of Dream Drop Distance is intended to lead right into Kingdom Hearts III. The tale follows Sora and Riku. Both young men are tasked with completing a special Mark of Mastery exam by Yen Sid to determine who will be designated as a true Keyblade Master. The exam dictates that the two will have to unlock seven worlds from their deep slumbers. After accomplishing this task, the title of Keyblade Masters will be theirs. 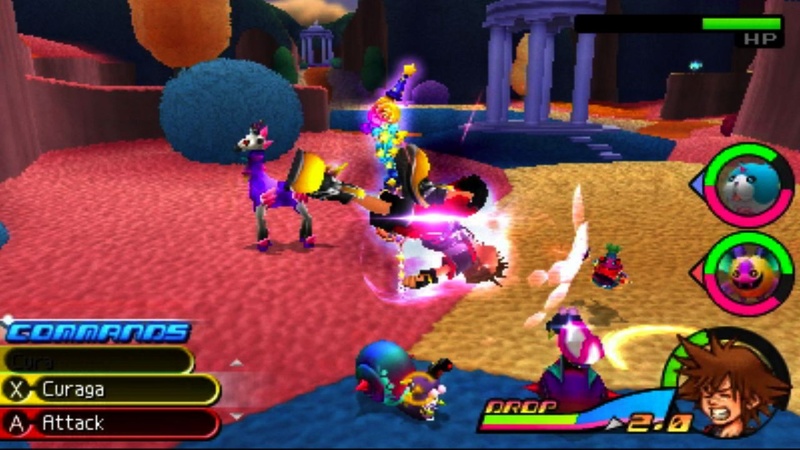 Unfortunately, evil Dream Eaters, the enemies of Kingdom Hearts 3D, stand in the way as do other bothersome beings. After the original Kingdom Hearts, the plot of the series became quite convoluted with the introduction of Organization XIII, Roxas, and the Nobodies. 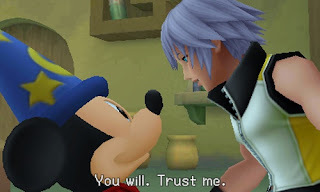 For the most part throughout the game's seven worlds, the plot is somewhat simple to understand -- a Disney villain is doing something sinister or a character needs Sora or Riku's assistance. But when the true antagonists enter the fray, things get particularly murky and confusion will no doubt flood your mind. Thankfully, if you haven't played previous games in the series, you can take a look at summaries of past games that will show up as you play through Dream Drop Distance. Whether they make any sense to you is another story. All for one, and three for five! Even though Sora and Riku are visiting the same worlds, they are never together. In a sense, they are in parallel universes, but the game doesn't really refer to this idea as such. Regardless, you will be switching between Sora and Riku throughout the game and usually after a set period of time. There is a mechanic in the game known as Drops. You have a gauge that slowly decreases as time goes by -- at least when you are exploring or in an encounter with enemies. When it reaches near the end, Bonus Time activates, a thirty second period where enemies drop more rewards than usual before you automatically get dropped out of whatever you were doing and take control of the other character. When you resume taking control of the character that was dropped, you will be in the exact same area that you were when you originally dropped out. Spells can help even the odds rather quickly. 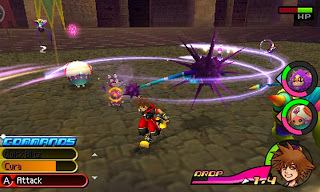 Drop Points (or DP), earned by defeating foes and successfully completing Link Portals (found around the various worlds where you defeat all the spawned enemies and satisfy an objective), are tallied up when a character is dropped out of the action, and they can be spent to give the next character an advantage. These can be attack and/or defense increases, making the drop gauge decrease at a slower pace, or exchanged to get a rare item. Any DP that is not spent will be converted into Munny, the currency of Kingdom Hearts. You can opt to manually drop out to change characters if you so choose to do so. The only problem I have with this mechanic is that you can be dropped out of boss battles when the gauge is fully depleted. This is especially annoying if you have whittled the health of an excruciatingly difficult adversary to near defeat, and then you run out of time on your drop gauge and are dropped out. When you return to the battle, you must start it all over again with the boss at full HP. That is absolutely maddening on the off chance that this happens. Like every other game in the series, Kingdom Hearts 3D is an action-RPG with plenty of chances for platforming and discovering treasures. In fact, spread across both Sora and Riku's campaigns and through all seven worlds are over 400 treasure chests to find and open. Thankfully, the game records all treasure chests that have been found, as well as what Dream Eaters you've encountered, trophies you've obtained through accomplishing specific in-game goals, and plenty of other information such as tutorials and glossaries for the uninitiated. An example of a Dream Eater. 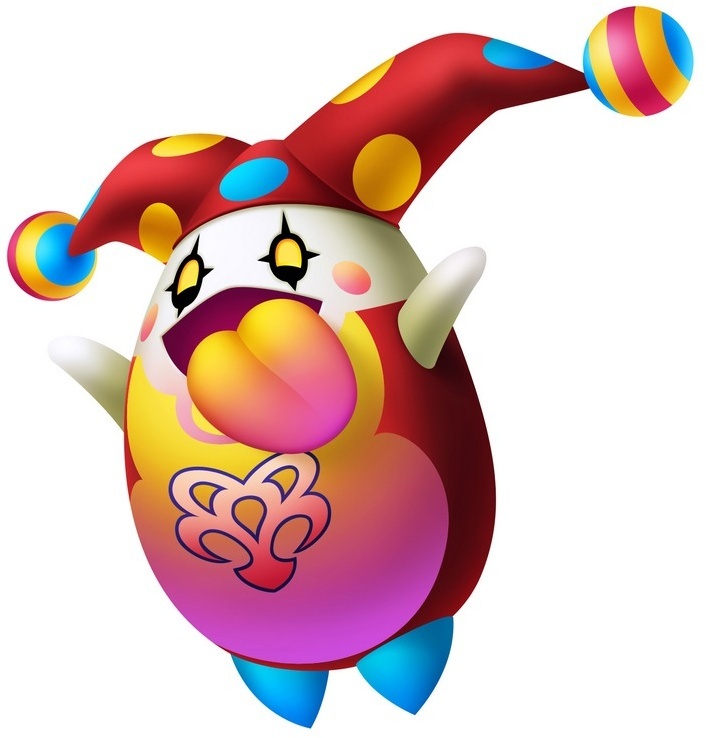 Speaking of Dream Eaters, these aren't just ferocious nightmares threatening to disrupt the worlds they inhabit. No, there are friendly varieties that can join Sora or Riku's side in the many fights of the game. These creatures known as Dream Eater Spirits (I'll refer to them mostly as Spirits from now on to avoid confusion) which essentially replace Donald and Goofy's roles of past mainline Kingdom Hearts titles. Through obtaining recipes and utilizing materials found in treasure chests, bought at a Moogle's shop, or dropped by defeated foes, you can create new Spirits to add to your team. From a frog to a T-rex, the spectrum of animal archetypes the Spirits are based off of is bound for you to have a favorite. You can hold three Spirits in a party, two to duke it out alongside you and one in reserve if one were to perish. Just like Sora and Riku, Spirits gain levels. By nurturing your collection of Spirits, they gain points that can be used to get new commands (like spells and offensive maneuvers) and stat boosts (HP increases and elemental resistances) for Sora and Riku. However, the stat-boosting effects only last as long as the Spirit who gives them to you stay in your party. 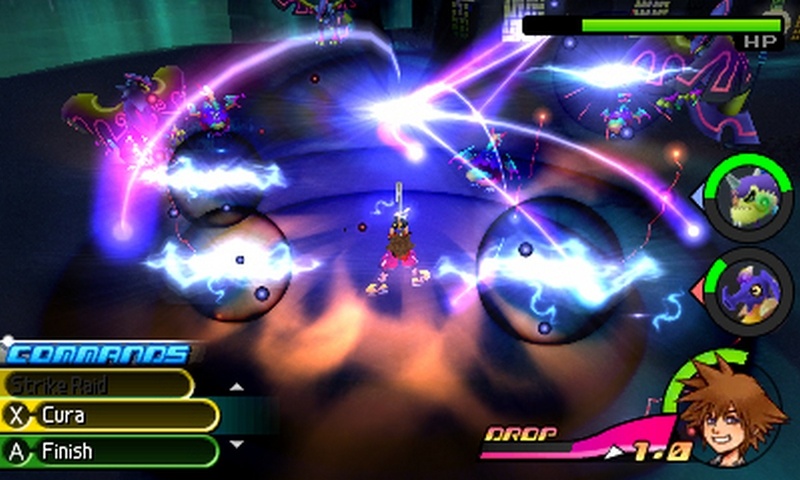 Spirits fight, defend, and battle along Sora or Riku against baddies and bosses alike. As they fight, their Link Gauge increases. Once full, they can be used to unleash a special attack on opponents. If both Spirits in your party have their Link Gauge full, a devastating attack known as a Dual Link occurs. Riku reeks havoc on those silly enough to challenge him. 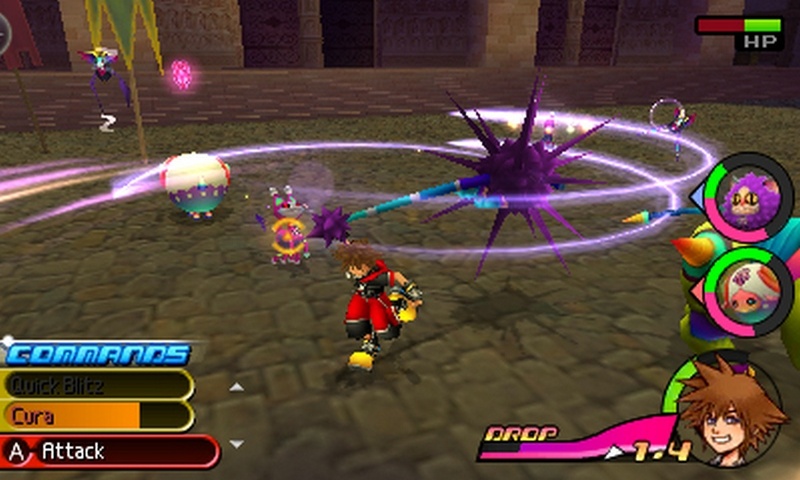 Outside of traditional combat, Spirits can even be used in a coliseum-type mini-game where two teams of three Dream Eaters battle it out in a game called Flick Rush. This is completely optional, but earning medals from playing the mode does reward you with items that are hard to come by anywhere else in Dream Drop Distance. As for Sora and Riku, their combat consists of striking Dream Eaters with their Keyblades, using attacks, items, and spells from their command lists (cycled through with the d-pad), correctly timing blocks to counter baddies, rolling out of the way to avoid hazardous assaults, and the new gameplay mechanic-- one that I absolutely adore-- Flowmotion. Flowmotion allows Sora and Riku to slide into a wall, surrounding them in an aura, and giving them the ability to dash at high speeds, jump from wall to wall, swing fast from lampposts and poles, and strike enemies with powerful chains of offensive wonder. In some worlds it can be easy to abuse Flowmotion, making some skirmishes particularly with large numbers of enemies to be a breeze. It can also make platforming irrelevant as you can just keep boosting into a wall to jump higher and higher. Regardless of these potential issues some players may have, I found the increased speed and mobility to be a blast. Kingdom Hearts 3D has one of my favorite battle systems in the series, and Flowmotion is an important part as to why. Can you even tell what's going on in this screen? 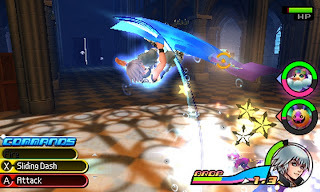 Other than Flowmotion, Kingdom Hearts 3D separates itself from other games in the series by using the 3DS's touch screen for Reality Shift maneuvers. Reality Shifts are all touch-based, and they vary from world to world. A pink arrow on the bottom screen flashes, signaling you to swipe or hit a button to initiate the Reality Shift. For instance, in Traverse Town, the opening world of the game, you pull back on the barrel on the touch screen like a slingshot to chuck it into a foe or series of foes, successfully eliminating them. Reality Shifts can seem like mere gimmickry, the necessity to always need to have your stylus close in hand for them is annoying, and the abundance of them is off-putting, but... where was I going with this to say something positive about them? Oh, I know! Reality Shifts can occasionally be considered fun. It's prudent of me to note that Kingdom Hearts 3D allows for the Circle Pad Pro attachment to be utilized. However, I did not feel or have the need to use it throughout my Dream Drop Distance experience at all. Manually turning the camera with the shoulder buttons is simple and practical enough, locking onto Dream Eaters and bosses through tapping both at the same time is non-problematic, and other functions came easily to me. There is just no need for the attachment. It's totally not required. sometimes the best way to fight is to run. As touched upon earlier in this review, there are seven worlds for Sora and Riku to fully explore. The majority of these are entirely never-before-seen from such as The Hunchback of Notre Dame's La Cité des Cloches, Pinocchio's Prankster's Paradise, and Fantasia's Symphony of Sorcery. My main beef with the worlds, however, regardless of how fun they are, is how empty most of them feel. Where are the NPCs to look at? Why is everything so barren? Even though Sora and Riku visit the same worlds, most of the time they are journeying through different areas, though there is some overlap. The benefit of a map on the bottom screen helps so much in finding where you entered an area at and all possible exits. Getting lost is a thing of the past. But before Sora and Riku can visit a given world, they must dive into it, hence Dive Mode. This takes the place of the Gummi Ship segments from Kingdom Hearts I and II. 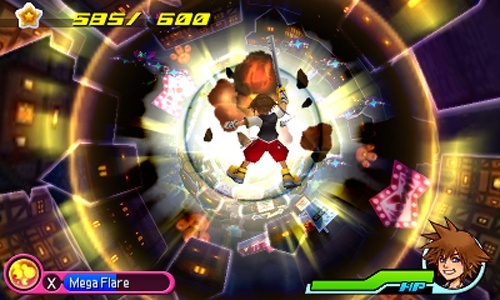 You control Sora or Riku and must accomplish a given objective before time runs out. Such objectives include collecting a set number of prize points or beating a boss. After the objective is clear, the goal ring opens, unveiling the way to the actual world. The faster the time, the better your score, the better your letter grade (with an A giving you a special prize). These segments break up the action, but they seem forced and unnecessary. You won't get this kind of ride at Disneyworld! An initial run of Dream Drop Distance lasted me approximately twenty hours, and that was without finding and opening all of the treasure chests or beating the secret boss. (Unfortunately, the secret boss automatically occurs in a certain place of the game, making opening the treasure chests in that area to be impossible unless you beat the immensely tough boss.) Even after the main game is completed, you have the option of starting a New Game+, where all of your Dream Eater Spirits, recipes, and trophies carry over. There are multiple difficulties to try to master, making for a game that can last quite a while. The added benefit of cutscenes allowing themselves to be paused and skipped at any time makes repeated play-throughs quicker and much more manageable. Kingdom Hearts 3D shines in its presentation. Disney and Square Enix have created colorful and crisp worlds and characters, all sporting impressive geometry and animation. I found the effort for the mouths of the characters to sync somewhat with the words being said to be alluring, as was the top-notch cast of all-star voice actors, all performing their parts tremendously. The game runs steady for the most part, but things can get a little rocky when there's multiple creatures and effects on the screen. I've had bouts of slowdown at sporadic periods during my time with the game. Yoko Shimomura returns to scribe the sensational score of the game. Takeharu Ishimoto also provides some remixes of songs from The World Ends With You (like Calling and Someday) to the game as the main cast of that game shows up on several occasions throughout Traverse Town. If there is one flaw I have towards the music of Kingdom Hearts 3D, it is that Sanctuary is once again a prominent tune. We couldn't get Utada Hikari to come up with an all-new theme after all of these years? I digress. The package as a whole is delightful. Kingdom Hearts 3D: Dream Drop Distance is without a doubt the best Kingdom Hearts game on a Nintendo platform. (Though, looking at the competition, that isn't that big of a deal to boast about.) 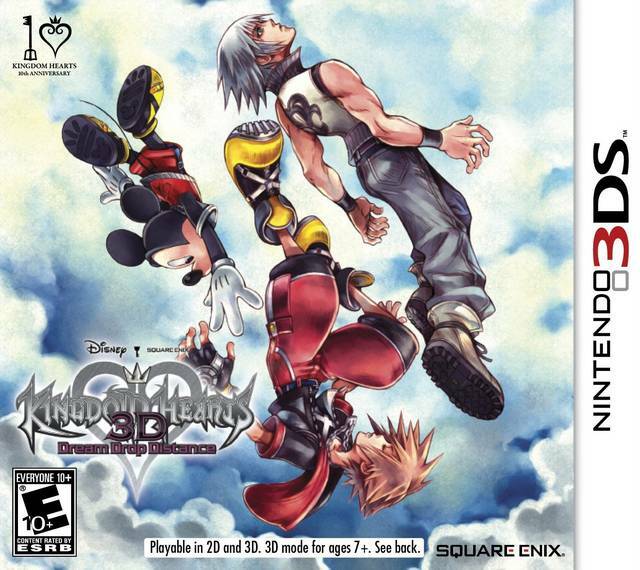 I'd say that I enjoyed this entry in the series much more than the PSP's Birth by Sleep. It isn't a perfect game (the Drop mechanic can be irritating and inconvenient at spots), but the addition of Flowmotion, the collectible nature of Dream Eaters, and the all-new worlds make for a Kingdom Hearts game that feels like a genuine big-time effort, and not some throwaway spinoff in the series like Re:Coded felt. This is the true lead-up to Kingdom Hearts III, and even if you haven't yet experienced this Disney + Square Enix collaboration series yet, Dream Drop Distance is the terrific opportunity to start. It has fast and frenetic action, it requires more tact than simple button-mashing, and it features a fantastic reminder as to why this action-RPG series is so highly regarded.